Research at Huntsman Cancer Institute (HCI) at the University of Utah (U of U) yielded new insights into the environment surrounding different types of lung tumors, and described how these complex cell ecosystems may in turn ultimately affect response to treatment. The results were published today in Immunity and featured on the print cover of the journal. Lung cancer is the leading cause of cancer death among men and women. According to the American Cancer Society, the disease kills more people each year than colon, breast, and prostate cancers combined. Therefore, uncovering the precursors and behaviors of lung cancer remains a major target among scientists working to improve cancer outcomes. Cells live in complex, distinct communities that scientists refer to as microenvironments. These microenvironments have many features that impact how a cell grows, how it behaves, and how it communicates with other nearby cells. In the case of cancer, researchers work to understand the microenvironment of a tumor to try to identify opportunities for possible therapeutic approaches. Using a mouse model developed by her lab, along with sophisticated single-cell sequencing technology, Oliver’s work uncovered clues to the role neutrophils, a type of immune cell, play in different types of lung cancer. In humans and other organisms, neutrophils are the body’s ‘first responders’ to an injury. Neutrophils are present at sites of trauma such as a cut, and they are part of the body’s innate response to fighting a tumor. It had been previously shown that poor prognosis in lung cancer and poor response to immunotherapy treatment for lung cancer were associated with high levels of neutrophils. “The association of high presence of neutrophils with a bad response to immunotherapy means neutrophils might be a target for scientists to develop new treatments to help people who aren’t responding well to currently available drugs,” Oliver suggested. Oliver found that the tumors changed the behavior of the neutrophils, causing inhibition of their normal roles and influencing them to behave in ways that supported tumor growth. Gurkan Mollaoglu, a PhD student in the Oliver lab, conducted the laboratory work. 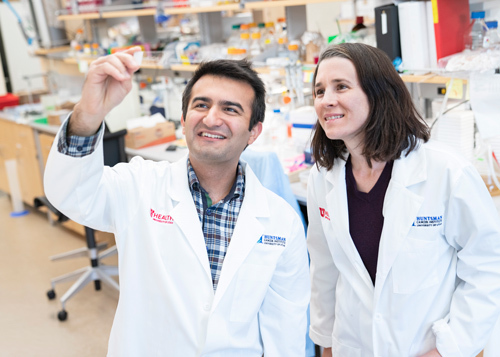 “It is both challenging and exciting to study how cancer cells shape their environment to become more favorable for the cancer,” says Mollaoglu. “The mouse models that we developed here are powerful tools that mirror many features of human tumors. Using these models, we showed how cancer cells modify their microenvironment and how the altered microenvironment, in return, favors cancer cells.” Earlier this year, based on his accomplishments with this work, Mollaoglu was chosen to attend the 68th Lindau Nobel Laureate Meeting, an annual meeting where select young scientists meet several dozen Nobel laureates. The Oliver lab and Eric Snyder, MD, PhD, HCI cancer researcher and assistant professor of pathology at the U of U, made critical contributions to the study. In the next steps of the work, Oliver and her team plan to characterize what the neutrophils do to help the tumors, and whether altering neutrophils can improve response to lung cancer therapies. The study was funded by the Huntsman Cancer Foundation, National Institutes of Health/National Cancer Institute (P30 CA042014, R01 CA187457, F99 CA223015), Damon Runyon Cancer Research Foundation, the V Foundation for Cancer Research, American Cancer Society, and the University of Utah Immunology, Inflammation, and Infectious Diseases initiative. Cells live in complex communities called microenvironments, where many different types of cells interact with one another. In cancer, the microenvironment is a place where cancer cells and healthy cells interact. Oliver's study outlines a lung tumors' influence on immune cells in its microenvironment. Represented in illustration A is a lung tumor. The lung tumor’s microenvironment includes many types of healthy cells and cancer cells, in illustration B. Within this microenvironment, lung cancer cells influence immune cells to develop behaviors that support the cancer cell as reflected in illustration C. Figure provided by the Trudy Oliver lab. Huntsman Cancer Institute (HCI) at the University of Utah is the official cancer center of Utah. The cancer campus includes a state-of-the-art cancer specialty hospital as well as two buildings dedicated to cancer research. HCI treats patients with all forms of cancer and is recognized among the best cancer hospitals in the country by U.S. News and World Report. As the only National Cancer Institute (NCI)-Designated Comprehensive Cancer Center in the Mountain West, HCI serves the largest geographic region in the country, drawing patients from Utah, Nevada, Idaho, Wyoming, and Montana. More genes for inherited cancers have been discovered at HCI than at any other cancer center in the world, including genes responsible for hereditary breast, ovarian, colon, head, and neck cancers, along with melanoma. HCI manages the Utah Population Database, the largest genetic database in the world, with information on more than 11 million people linked to genealogies, health records, and vital statistics. HCI was founded by Jon M. and Karen Huntsman.